Welcome to PeerWise. This guide, intended for instructors considering using PeerWise, gives a quick description of the tool and outlines some of the potential benefits to both students and staff. It includes a few suggestions for using PeerWise in your course and for motivating students. Typically, at the beginning of a term, a course using PeerWise begins with an empty repository. This grows gradually as the course progresses and students author and contribute relevant questions. All activity remains anonymous to students, however instructors are able to view the identity of question and comment authors and have the ability to delete inappropriate questions. In practice, instructor moderation is rarely necessary and PeerWise is often used with little staff involvement. 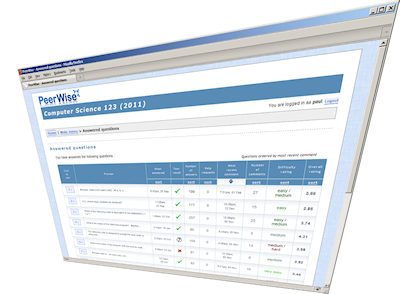 PeerWise has been used in courses covering a variety of disciplines. Anthropology, Biology, Chemistry, Computer Science, Maths, Medicine, Physics, Population Health, Psychology, and more. Any course for which it makes sense for students to author their own multiple-choice questions and to explain their understanding of a topic in their own words could benefit from using PeerWise. Designing questions: Generating a question requires students to think carefully about the topics of the course and how they relate to the learning outcomes. Writing questions focuses attention on the learning outcomes and makes teaching and learning goals more apparent to students. Choosing distractors: The act of creating plausible distracters (multiple-choice alternatives) requires students to consider misconceptions, ambiguity and possible interpretations of concepts. Writing explanations: Explanations require students to express their understanding of a topic with as much clarity as possible. This acts to develop their written communication skills and deepen their understanding. Answering questions: Answering questions in a drill and practice fashion reinforces learning, and incorporates elements of self-assessment. Students are shown how others have answered the same questions, allowing them to gauge how well they are coping in the course. Evaluating quality: Evaluating existing questions incorporates higher-order cognitive skills, requiring a student to consider not only the content, but what makes a particular question more effective than other questions. Early feedback: Instructors can see how students are answering individual questions in real-time, and can identify and address common misunderstandings in a timely fashion. Analysing student comments can reveal further insight into the student perception of topics within the course. Large test banks: The development of MCQ test banks is a very time consuming activity, and placing this in the hands of the students is a fast, low cost way for instructors to have access to a large body of MCQ test items designed specifically to test the course content. Student confidence: By evaluating the topic areas that students have created questions for, instructors can get a sense of which topics students are more confident with and which topics students are not engaged with. Large classes: PeerWise performs well in large classes. The number of high-quality questions is greater and students therefore have access to a higher number of effective questions. Assessment: allocate a small percentage of course marks for participation. This ensures that enough students contribute questions to make the repository worthwhile, and it shows students that their instructor regards the activity as important. Typical values are around 2-5% of the students’ final grade. Allocating these marks only for participation eliminates the need for grading the student questions. Contribution requirements: in courses with a high workload, requiring students to contribute too many questions may be perceived negatively and may lower the overall quality of the repository. Students should be allowed time to develop a good quality question on a topic they have researched, and to provide an accompanying detailed explanation in their own words. Typical requirements may have students contributing 2 or 3 questions over the course of a 10 week term. Students are generally willing to answer questions on a voluntary basis, so a requirement of 10-20 answers per term would usually be easily achieved. In addition, students should be encouraged to evaluate the questions they answer, and when appropriate provide constructive open-ended comments. The question authoring and answering deadlines could be spaced out over the term to avoid a large amount of activity on a single deadline. Motivating students: using very good PeerWise questions in formal examinations is a simple way to motivate students. Adding some of your own questions can also encourage students to participate and give them examples of well designed questions. Awarding prizes for students appearing on the leaderboards or with high reputation scores may also be a good motivator for some students.